The third week of the new year has come and gone. It was a fun week because I learned of my partner assignments in the Mouthy Stitches swap and For The Love of Solids Swap. 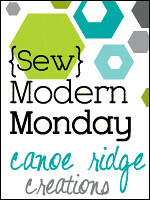 The Mouthy Stitches are a group run by three of my best blog buddies. Susan Canadian Abroad, Hadley Flying Blind on a Rocket Cycle and Cindy Fluffy Sheep Quilting have set the tone of this swap to be fun and chatty, just like they are. We need to make a zippered pouch of some sort. I am stalking my partner and have almost decided what to make her. I'll be posting a few teasers and hope she comments on the photos and gives me some positive feedback. Now the FTLOS swap has some major talent in it, as does the Mouthy Stitches group. I will need to do more careful stalking of my partner before I decide what to make her. Megan Canoe Ridge Creations and Elizabeth Don't Call Me Betsy are doing a great job of organizing this large group of swappers. We can make anything in this swap that our partner has requested or hinted that they would like. It can be anything from a mini quilt to a sewing machine cover and everything in between. The postman rang more than twice this week. Not only did I receive some really cute clothes I ordered from one of my favorite catalogs, Boden, but I also received some beautiful fabrics that I have been waiting patiently to arrive. Julie from the Intrepid Thread has known that I am completely taken by Malka Dubrawsky's new fabric, A Stitch in Color. I ordered the entire line in a FQ bundle as soon as she told me it had arrived to her online shop and I also chose a few solids to have as background. In my excitement to get my order in right away I accidentally ordered 5 yards of the Acid Green solid instead of the Acid Green Lines. Julie, being the sweetheart that she is, has agreed to exchange it for me. Unfortunately, this fabric is selling like wildfire, but we did find some other substitutions that I think will make a great scrappy back when I make this quilt. The colors in this line are so vibrant and look like hand dyed fabrics. 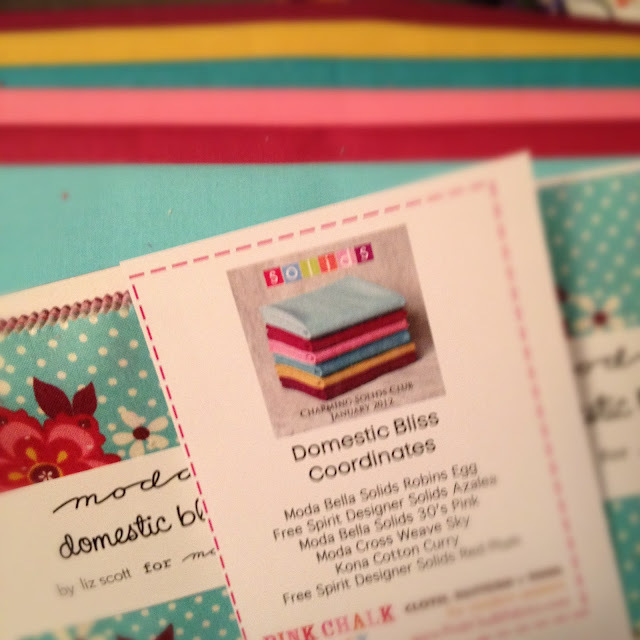 Pink Chalk Fabrics had a solids club that I was really enjoying but changed it up this month. Now we get 2 charm packs with coordinating solids. This is a fun club because the part of matching solids and then finding them is already done for us. This month's charm pack was the cute Domestic Bliss by Liz Scott for Moda. And speaking of charm squares...last year I ordered a Fig Tree kit of Joanna Figueroa's Strawberry Fields fabrics. In the last few days I have pieced, quilted and bound this quilt. It's for a friend who may or may non read this blog so I don't want to give too much information. But I can show you this photo. I am really happy with the way it has come together. It is the first quilt finish of the year for me and all pieced and quilted on the new Bernina 820. What a dream machine this is. Mr. Romance did a fantastic job of shopping for Christmas 2011! This post is running a little long but I have a lot to say this week. I used to try to post every day but lately it is only a few times a week. So one more thing to tell you. I went to the Road to California quilt show on Thursday and I was so disappointed. I have been attending this show for about 7 years and this was probably the last time I will go. It is so crowded and most of the people there are of the "art quilt" or non-modern quilt types. I give a lot of credit to the talented people who can make these quilts. Their art is beyond my whole realm of design concept. I mainly went to look at the new gadgets. I bought the curved piecing foot attachment for the Bernina. I really want to try curved piecing and have a plan to do a Drunkard Path quilt. This foot is supposed to make it super simple. 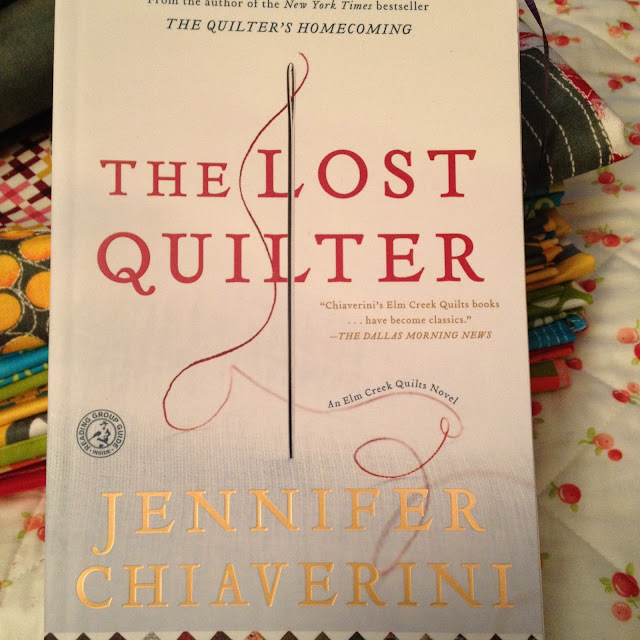 and the next book in Jennifer Chiaverini's series. I think I have read almost every one of her books in this series. 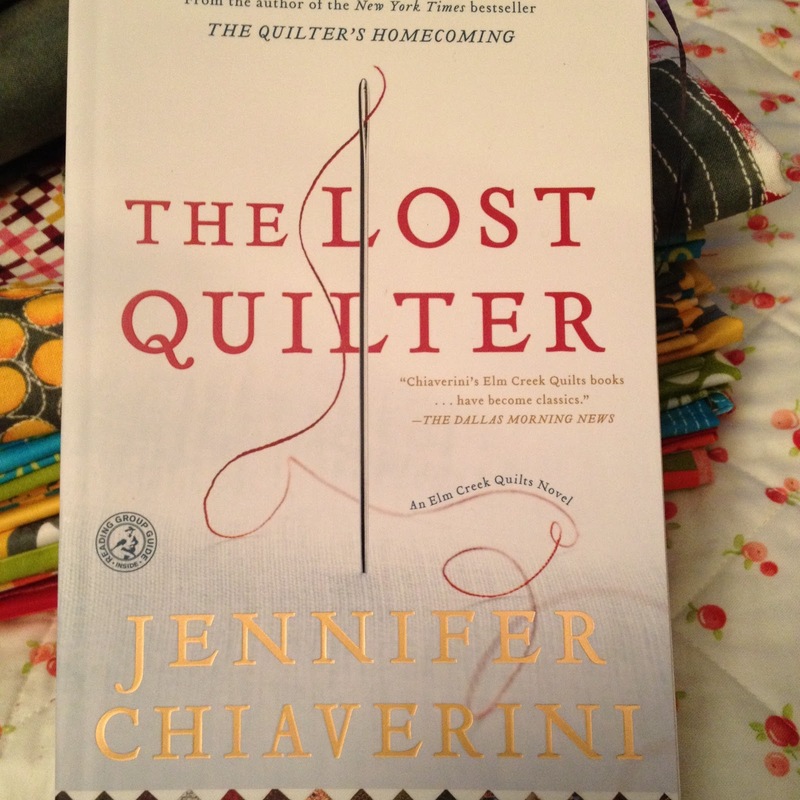 They are a fun, easy read, and sometimes you even learn something about quilt history or techniques. I am really enjoying the Instagram app on the iphone so I have added a link at the top of the blog if you want to follow my Instagram photos. I went to Road to CA on Thursday too...It was MUCH more packed than a normal Thursday (at least I thought so) I wish I had seen that twill tape! I would have bought some, for sure!! You have a new machine - how fabulous! Love that fabric and the swaps are going to be huge fun! I would love to join one of those FQ clubs though, I'm considering using my council tax money for next month to join a Japanese one, and the money for March to join a solids one (we get those months off paying council tax, so as the money is set aside to pay the bill anyway, I always treat myself to something with it) Love that wee quilt you've whipped up with it though, you've inspired me to put one together for a friend that's very ill at the moment. Sorry about the show though, I was really disappointed with the Scottish one I went to, but I figured that was because the UK tends to be rather behind the US when it comes to crafts (although I think we're catching up better than we were in 2003-4 now the internet is more established as a buying arena) The twill tape is fab though, have fun with it! 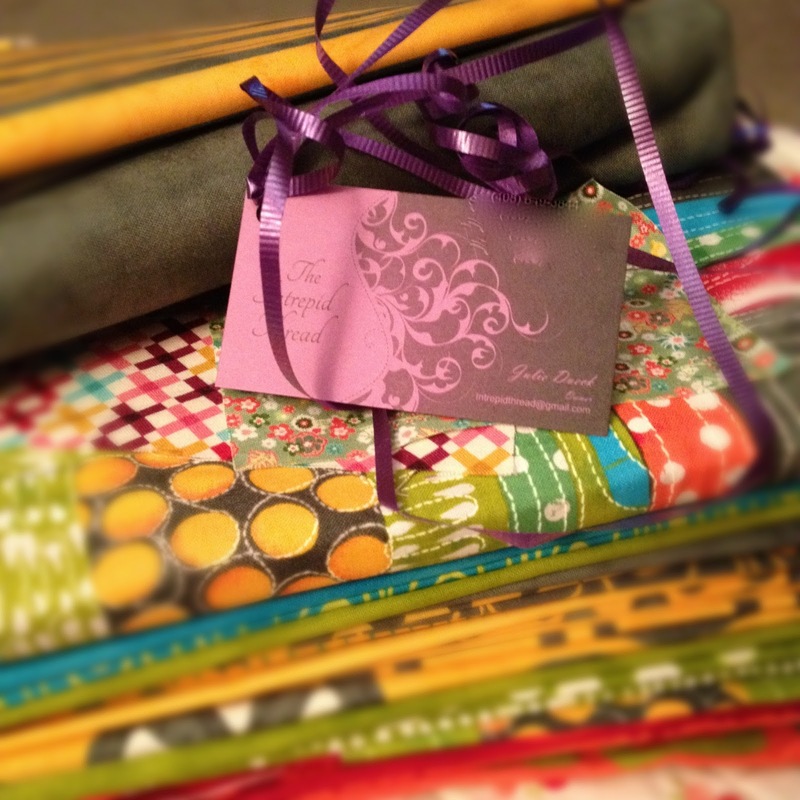 I rec'd my package from Pink Chalk Fabrics as well and love it. So glad they changed it up. Love the twill tape. Need to get some of that myself. Have a great week. I love the twill tape- especially the one with the letters. So cute. The quilt looks beautiful and I am quite impressed with your quick finish. Have a great week Di! Hi Diane I like the idea of the fabric pack club! Cant wait to see your star! That sounds like a lovely week, I love all those fabrics you have acquired! 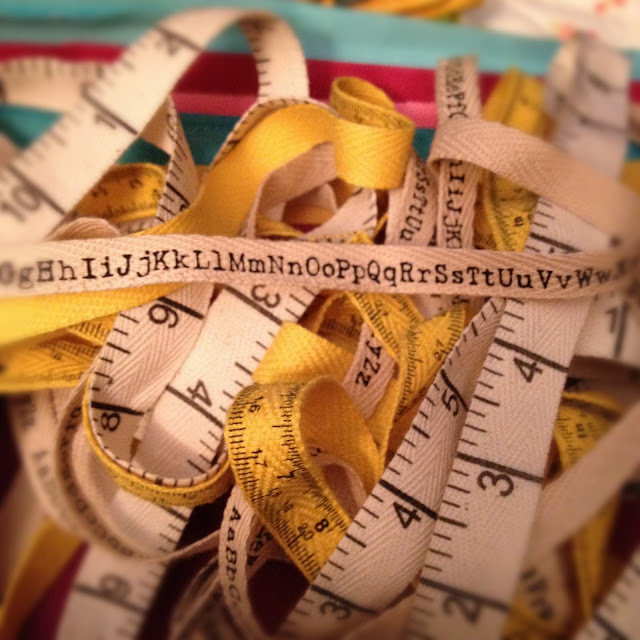 What a fantastic fabric stash you must have! Trying to not be jealous here. Love the twill tape too. So pleased the Bernina is living up to all your expectations and then some! Beautiful fabrics and the quilt is wonderful. 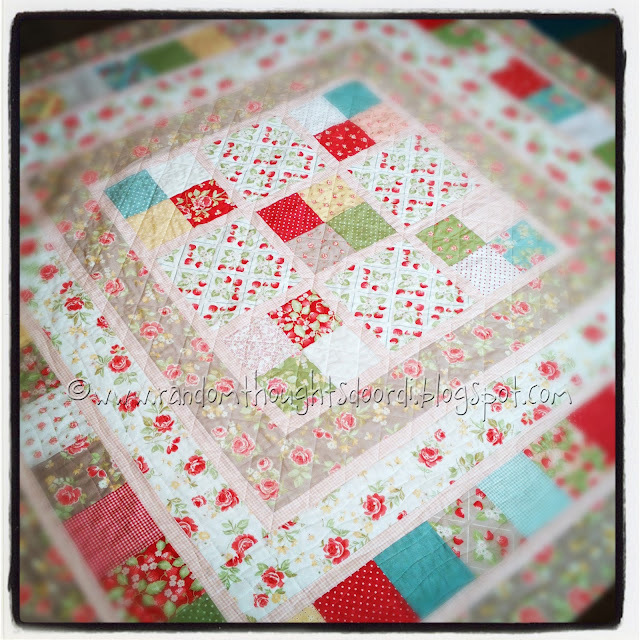 Oh my goodness, I totally love the strawberry fields quilt! Your friend is very lucky!